1 Understanding "measurement" and "signature"
Measurement and Signature Intelligence, or MASINT, brings together a variety of disciplines complementary to the technical "mainstream" of imagery intelligence and signals intelligence. MASINT, however, may be have aspects of intelligence analysis management, since certain aspects of MASINT, such as the analysis of electromagnetic radiation received by SIGINT sensors are more of an analysis technique as collection method. Other MASINT techniques, however, require purpose-built sensors. Where other intelligence collect direct evidence of events, MASINT tends to be indirect. Imagery intelligence (IMINT) takes pictures of human-recognizable things; MASINT looks for movement between successive pictures, or examines the color spectrum in a visible-light photograph to tell if the green is a plant or camouflage paint. Where communications intelligence listens to a spoken message, MASINT listens to the noise in the background and identifies distortion of a particular microphone. According to the United States Department of Defense, MASINT – when collected, processed, and analyzed by dedicated MASINT systems – produces intelligence that detects, tracks, identifies, or describes the signatures (distinctive characteristics) of fixed or dynamic target sources. MASINT was recognized as a formal intelligence discipline in 1986.  . One vivid image of MASINT, by William K. Moore, is that "MASINT looks at every intelligence indicator with new eyes and makes available new indicators as well. It measures and identifies battlespace entities via multiple means that are difficult to spoof and it provides intelligence that confirms the more traditional sources, but is also robust enough to stand with spectrometry to differentiate between paint and foliage, or recognizing radar decoys because the signal lacks unintentional characteristics of the real radar system. At the same time, it can detect things that other sensors cannot sense, or sometimes it can be the first sensor to recognize a potentially critical datum." It can be difficult to draw a line between tactical sensors and strategic MASINT sensors. Indeed, the same sensor may be used tactically or strategically. In a tactical role, a submarine might use acoustic sensors -- active and passive sonar -- to close in on a target or get away from a pursuer. Those same passive sonars may be used by a submarine, operating stealthily in a foreign harbor, to characterize the signature of a new submarine type. While certain MASINT subdisciplines, such as sonar, are familiar, the "MASINT mindset" that considers the full range of technologies is a challenge for the active services, so they can be used by warfighters . It can also be difficult to draw the line between MASINT and technical intelligence (TECHINT). A good distinction is that a technical intelligence analyst often has possession of a piece of enemy equipment, such as an artillery round, which can be evaluated in a laboratory. MASINT, even MASINT materials intelligence, has to infer things about an object that it can only sense remotely. MASINT electro-optical and radar sensors could determine the muzzle velocity of the shell. MASINT chemical and spectroscopic sensors could determine its propellant. The two disciplines are complementary: consider that the technical intelligence analyst may not have the artillery piece to fire the round on a test range, while the MASINT analyst has multispectral recordings of it being used in the field. In the context of MASINT, measurement obtains finite metric parameters of targets. Signature covers the distinctive features of phenomena, equipment, or objects as they are sensed by the collection instrument(s). The signature is used to recognize the phenomenon, equipment, or object once its distinctive features are detected. MASINT measurement searches for differences from known norms, and characterizes the signatures of new phenomena. For example, the first time a new rocket fuel exhaust was measured, it would be a deviation from a norm. When the properties of that exhaust were measured, such as its thermal energy, spectral analysis of its light (i.e., spectrometry), etc., that becomes a new signature in the MASINT data base. While there are specialized MASINT sensors, much of the MASINT discipline involves analysis of information from other sensors. For example, a SIGINT sensor may provide information on the specific characteristics and capabilities of a radar beam, which would be part of ELINT. That same sensor, however, may provide information about the "spillover" of the main beam (sidelobes), or interference its transmitter produces. Those incidental characteristics, are MASINT disciplines. Putting these concepts together is challenging; MASINT specialists themselves struggle with providing simple explanations of their field . One attempt calls it the "CSI of the intelligence community" , in imitation of the television series Crime Scene Investigation This is useful only to the extent that it emphasizes MASINT depends on a great many sciences to interpret data, where COMINT would deal with the meaning in an intelligible human message. Interpreting that message is not trivial, in that it would require idiomatic knowledge of the language involved, any specialized terminology being discussed, and inferences about emotional states and other subtle clues. Another analogy uses medicine as a basis . If you have been weighed, that is a gravity measurement, which will be compared against signatures such as underweight, normal, and overweight for your height, age, and build. Gravity measurements proper fall under geophysical MASINT. Similarly, biopsies measure tissue samples against normal cell signatures, and are a form of materials MASINT. There has been work on developing standardized terminology and architecture in NATO . Other work addresses the disappointments of Non-Cooperative Target Recognition . For this function, infrared beacons (infrared MASINT) proved disappointing, but millimeter-wave recognition shows more promise. Still, cooperative, network-based position exchange may be superior for avoiding fratricide, since MASINT cannot help differentiate between the same tank or aircraft, one operated by a friend and the other by an enemy. Numerous countries produce their own antisubmarine warfare sensors, such as hydrophones, active sonar, magnetic anomaly detectors, and other hydrographic sensors that are frequently considered too "ordinary" to be called MASINT. China is not reported to be pursuing the more specialized MASINT technologies , although it does produce its antisubmarine sensors. Germany's SAR Lupe is a constellation of five X-band satellites in three polar orbits. Following the first successful launch on December 19, 2006, Germany, using a Russian booster, launched the second satellite in its planned five-satellite SAR-Lupe synthetic aperture radar constellation on . Italy and France are cooperating on the deployment of the dual-use Orfeo civilian and military satellite system. Orfeo is a dual-use (civilian and military) earth observation satellite network developed jointly between France and Italy. Italy is developing the Cosmo-Skymed X-band polarimetric synthetic aperture radar, to fly on two of the satellites. Russia does have nonimaging infrared satellites to detect missile launches. Russia produces, of course, a wide range of antisubmarine warfare sensors. Besides access to US technology of its own, and its extensive ASW acoustic sensors, the UK has developed a acoustic artillery location system, which complements US counterartillery radar. Within the US Intelligence Community the Directorate of MASINT and Technical Collections office of the Defense Intelligence Agency is the central agency for MASINT. This was formerly called the Central MASINT Office. For education and research, there is the Center for MASINT Studies and Research of the Air Force Institute of Technology. ELINT support peculiar to the penetration problems associated with the Agent's reconnaissance program under NRO. Maintain a quick reaction capability for ELINT and COMINT equipment." "CIA's Office of Research and Development was formed to stimulate research and innovation testing leading to the exploitation of non-agent intelligence collection methods....All non-agent technical collection systems will be considered by this office and those appropriate for field deployment will be so deployed. The Agency's missile detection system, Project [deleted] based on backscatter radar is an example. This office will also provide integrated systems analysis of all possible collection methods against the Soviet antiballistic missile program is an example." . It is not clear where ELINT would end and MASINT would begin for some of these projects, but the role of both is potentially present. MASINT, in any event, was not formalized as a US-defined intelligence discipline until 1986. CIA took on a more distinct MASINT responsibility in 1987. The National Security Archive said that in 1987, CIA created "... a new Office for Special Projects. concerned not with satellites, but with emplaced sensors – sensors that could be placed in a fixed location to collect signals intelligence or measurement and signature intelligence (MASINT) about a specific target." Such sensors had been used to monitor Chinese missile tests, Soviet laser activity, military movements, and foreign nuclear programs. The office was established to bring together scientists from the DS&T’s Office of SIGINT Operations, who designed such systems, with operators from the Directorate of Operations, who were responsible for transporting the devices to their clandestine locations and installing them. All nuclear testing, of any level, was forbidden under the Comprehensive Test Ban Treaty (CTBT), but there is controversy over whether the Comprehensive Nuclear-Test-Ban Treaty Organization (CTBTO) will be able to detect sufficiently small events. It is possible to gain valuable data from a nuclear test that has an extremely low yield, useless as a weapon but sufficient to test weapons technology. CTBT does not recognize the threshold principle and assumes all tests are detectable. The CTBTO runs an International Monitoring System (IMS) of MASINT sensors for verification, which include seismic, acoustic, and radionuclide techniques. See National technical means of verification for a discussion of the controversies surrounding the ability of the IMS to detect nuclear tests. Even though today's MASINT is often on the edge of technologies, many of them under high security classification, the techniques have a long history. Captains of warships, in the age of sail, used the electro-optical sensor of his eyes, and the geophysical sensors of his ears and sense of touch (a wetted finger raised to the breeze), to measure the characteristics of wind and wave. He used a mental library of signatures to decide what tactical course to follow based on weather. Medieval fortification engineers would put their ear to the ground to obtain acoustic measurements of possible digging to undermine their walls. Acoustic and optical methods for locating hostile artillery go back to the First World War. While these methods were replaced with radar for modern counterbattery action, there is a resurgence of interest in electro-optical (i.e., cannon flash or rocket plume) and acoustic (i.e., sounds of cannon) gunshot location against snipers and urban terrorists. Several warfighter applications areas are listed below; also see Deeply Buried Structures. At the leading edge of today's military requirements, which may be solved with MASINT, is Non-Cooperative Target Recognition (NCTR), which could, even with the failure of identification friend or foe (IFF) systems, prevent friendly fire incidents. One problem of such identification is when coalition partners use the same equipment, as did both Iraq and Syria have Russian T-72 tanks and French aircraft during Desert Storm. Ives mentions NCTR as a key MASINT tactical application. During the Cold War, the focus of naval operations was "blue water" far from land. In today's geopolitical environment, "green water" of coastal areas of ocean, and "brown water" on inland waterways, jointly forming the "littoral", create new challenges for modern ships in shallow water of the littoral . Several new technologies will be needed for shallow-water naval operations. Since acoustic sensors (i.e., passive hydrophones and active sonar) perform less effectively in shallow waters than in the open seas, there is a strong pressure to develop additional sensors to find targets. These will have to be coupled with sensors that give information on the water conditions of the littoral, which vary much more than in the deep open ocean. For example, in blue water, the bottom may be so deep so that it is out of sonar range and will give no acoustic reflections. In the littoral, not only will there be bottom reflections, but the bottom depth and texture will change with tides, seasons, and marine life. One family of techniques, which will require electro-optical sensors to detect, is bioluminescence: light generated by the movement of a vessel through plankton and other marine life. Another family, which may be solved with electro-optical methods, scatterometer radar, or a combination, is detecting wakes of surface vessels, as well as effects on the water surface caused by underwater vessels and weapons. In the littoral, there will be threats not encountered in the open ocean. In the planning for the WWII invasion of Japan, there was awareness that kamikaze tactics would not be limited to airplanes. Explosive-laden speedboats hidden along the coast, or small submarines silently on the bottom, could rush out, at close range, and ram naval vessels. The 12 October 2000 attack on the USS Cole, in a harbor, was only by one boat; consider that in the Iran-Iraq War, waves of teenage volunteers ran into minefields to clear them for the real soldiers following. Not all threats need be suicidal. Computer-controlled mines can appear to be one more large boulder on a rocky bottom, until a ship comes into range. Modern naval mines are not limited to explosive charges to which the target comes; the U.S. Mark 60 CAPTOR mine, while intended for antisubmarine warfare in the deep ocean, is an example of what can be done. When the CAPTOR senses a target, it releases a Mark 46 lightweight torpedo, the same that an antisubmarine helicopter would drop, which actively chases its prey. Another strong need where MASINT may help is with Unattended Ground Sensors (UGS) . During Vietnam, these did not provide the functionality desired of the McNamara Line and Operation Igloo White. They have improved considerably, but still complement a human on the ground and do not always replace him. In the US, many of the Igloo White technology came from Sandia National Laboratories, who subsequently designed the Mini Intrusion Detection System (MIDS) family, and the US Marine Corps' AN/GSQ-261 Tactical Remote Sensor System (TRSS). Another major US Army initiative was the Remotely Monitored Battlefield Sensor System (REMBASS), which it upgraded to Improved REMBASS (IREMBASS), and now is considering REMBASS II. The REMBASS generations, for example, increasingly intertwine interconnections of infrared MASINT, Magnetic MASINT, seismic MASINT, and acoustic MASINT The UK and Australia also are interested in UGS. Thales Defence Communications, a division of French Thales and formerly Racal builds the Covert Local Area Sensor System for Intruder Classification (CLASSIC) for use in 35 countries, including 12 NATO members. Australia adopted the CLASSIC 2000 version, which, in turn, becomes part of the Australian Ninox system, which also includes Textron Systems’ Terrain Commander surveillance system. CLASSIC has two kinds of sensors: Optical Acoustic Satcom Integrated Sensor (OASIS) and Air Deliverable Acoustic Sensor (ADAS), as well as television cameras, thermal imagers, and low-light cameras. ADAS sensors were in a US program, Army Rapid Force Projection Initiative advanced concept technology demonstration (ACTD), using OASIS acoustic sensors and central processing, but not the electro-optical component. ADAS sensors are emplaced in clusters of 3 or 4, for increased detection capability and for triangulation. Textron says that the ADAS acoustic sensors can track fixed-wing aircraft, helicopters, and UAVs as well as traditional ground threats. ACTD added Remote Miniature Weather Station (RMWS), from System Innovations. These RMWS measure temperature, humidity, wind direction and speed, visibility and barometric pressure, which can then be sent over commercial or military satellite links. UGS are especially challenging in urban areas, where there is a great deal more background energy and a need to separate important measurements from them. Acoustic sensors will need to distinguish vehicles and aircraft from footsteps (unless personnel detection is a goal), and things such as construction blasting. They will need to discriminate among simultaneous targets. Infrared imaging, for the urban environment, will need smaller pixels. If either the targets or the sensor is moving, micro-electromechanical accelerometers will be needed. 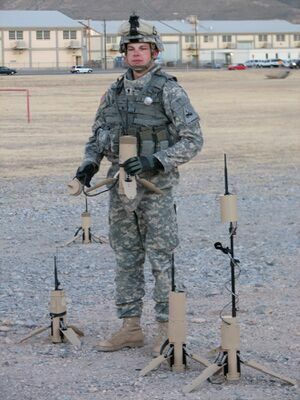 Newer generations are being deployed in the Reconnaissance, Surveillance and Target Acquisition Squadron (Brigade Combat Team), both in a general tactical version and one specific to urban combat. Still more of an UGS research program, under DARPA, is Smart Dust, which is a program for developing massively parallel networks of hundreds or thousand "motes", on the order of 1 mm3. Another DARPA program is WolfPack, a ground-based electronic warfare system to be ready by 2010. WolfPack is made up of a "pack" of "wolves". Wolves are distributed electronic detection nodes with location and classification capability, which may use radiofrequency MASINT techniques along with ELINT methods. The wolves could be hand, artillery, or airdrop delivered. WolfPack may fit into an Air Force program for a new subdiscipline of counter-ESM, as well as Distributed Suppression of Enemy Air Defenses (DSEAD), an enhancement on SEAD. If the Wolves are collocated with jammers or other ECM, and they are very close to the target, they will not need much power to mask the signatures of friendly ground forces, in frequencies used for communications or local detection. DSEAD works in a similar way, but at radar frequencies. It may be interesting to compare this counter-ELINT discipline with ECCM. An example of the interaction is "imagery-defined MASINT (IDM)". In IDM, a MASINT application would measure the image, pixel by pixel, and try to identify the physical materials, or types of energy, that are responsible for pixels or groups of pixels: signatures. When the signatures are then correlated to precise geography, or details of an object, the combined information becomes something greater than the whole of its IMINT and MASINT parts. As with many branches of MASINT, specific techniques may overlap with the six major conceptual disciplines of MASINT defined by the Center for MASINT Studies and Research, which divides MASINT into Electro-optical, Nuclear, Geophysical, Radar, Materials, and Radiofrequency disciplines. The two sets are not mutually exclusive, and it is entirely possible that as this newly recognized discipline emerges, a new and more widely accepted set will evolve. For example, the DIA list considers vibration. In the Center for MASINT Studies and Research list, mechanical vibrations, of different sorts, can be measured by geophysical acoustic, electro-optical laser, or radar sensors. Remote sensing depends on the interaction of a source of energy with a target, and energy measured from the target . In the "Remote Sensing" diagram, Source 1a is an independent natural source such as the Sun. Source 1b is a source, perhaps manmade, that illuminates the target, such as a searchlight or ground radar transmitter. Source 1c is a natural source, such as the heat of the Earth, with which the Target interferes. There are extensive civilian applications for remote sensing. In some cases, MASINT sensors may be commercial-off-the-shelf, used in an unusual way or combined with MASINT-specific sensors. Some MASINT sensors, of course, use extremely specialized techniques that are not public information. Alternatively, Sensor 1 might measure, as reflected radiation, the interaction of the Target with Source 1a, as in conventional sunlit photography. If the energy comes from Source 1b, Sensor 1 is doing the equivalent of photography by flash. Source 3a is under the observer's control, such as a radar transmitter, and Sensor 3b can be tightly coupled to Source 3. An example of coupling might be that Sensor 3 will only look for backscatter radiation after the speed-of-light delay from Source 3a to the target and back to the position of Sensor 3b. Such waiting for a signal at a certain time, with radar, would be an example of electronic counter-countermeasures (ECCM), so that a signal jamming aircraft closer to Sensor 3b would be ignored. A bistatic remote sensing system would separate source 3a from sensor 3b; a multistatic system could have multiple pairs of coupled sources and sensors, or an uneven ratio of sources and sensors as long as all are correlated. It is well known that bistatic and multistatic radar are a potential means of defeating low-radar-observability aircraft. It is also a requirement, from operations personnel concerned with shallow water operations. Synthetic aperture and inverse synthetic aperture radar have source 3a and sensor 3b colocated, but the source-sensor array takes multiple measurements over time, giving the effect of physical separation of source and sensor. Satellites, operating in microsatellite clusters, can use these methods, with the rotation of the earth providing the motion for synthesizing from multiple observations. 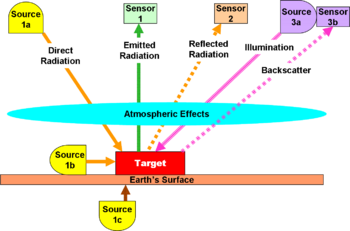 Any of the illuminations of the target (i.e., Source 1a, 1b, or 3a), and the returning radiation, can be affected by the atmosphere, or other natural phenomena such as the ocean, between source and target, or between target and sensor. Observe that the atmosphere comes between the radiation source and the target, and between the target and the sensor. Depending on the type of radiation and sensor in use, the atmosphere can have little interfering effect, or have a tremendous effect requiring extensive engineering to overcome. The atmosphere may absorb part of the energy passing through it. This is bad enough for sensing if all wavelengths are affected evenly, but it becomes much more complex when the radiation is of multiple wavelengths, and the attenuation differs among wavelengths. In addition, the atmosphere may cause an otherwise tightly collimated energy beam to spread. Recording return mechanisms, such as digital telemetry from satellites or aircraft, ejection systems for recorded media, or physical return of a sensor carrier with the recordings aboard. MASINT sensors may be framing or scanning or synthetic. A framing sensor, such as a conventional camera, records the received radiation as a single object. Scanning systems use a detector that moves across the field of radiation to create a raster or more complex object. Synthetic systems combine multiple objects into a single one. Sensors may be passive or coupled to an active source (i.e., "active sensor"). Passive sensors receive radiation from the target, either from the energy the target emits, or from other sources not synchronized with the sensor. Most MASINT sensors will create digital recordings or transmissions, but specific cases might use film recording, analog recording or transmissions, or even more specialized means of capturing information. 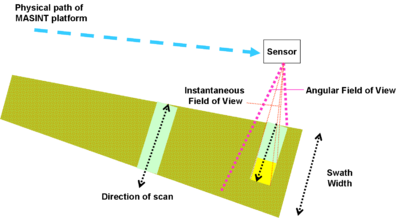 Figure "Remote Sensing Geometry" illustrates several key aspects of a scanning sensor. The instantaneous field of view (IFOV) is the area from which radiation currently impinges on the detector. The swath width is the distance, centered on the sensor path, from which signal will be captured in a single scan. Swath width is a function of the angular field of width (AFOV) of the scanning system. Push broom sensors either have a sufficiently large IFOV, or the scan moves fast enough with respect to the forward speed of the sensor platform, that an entire swath width is recorded without movement artifacts. These sensors are also known as survey or wide field devices, comparable to wide angle lenses on conventional cameras. Whisk broom or spotlight sensors have the effect of stopping the scan, and focusing the detector on one part of the swath, typically capturing greater detail in that area. This is also called a close look scanner, comparable to a telephoto lens on a camera. There are synthetic versions of whiskbroom sensors, which may combine parts of scans made on multiple passes, refining resolution through digital processing. Passive sensors can capture information for which there is no way to generate man-made radiation, such as gravity. Geodetic passive sensors can provide detailed information on the geology or hydrology of the earth. Active sensors are conceptually of two types, imaging and non-imaging. Especially when combining classes of sensor, such as MASINT and IMINT, it can be hard to define if a given MASINT sensor is imaging or not. In general, however, MASINT measurements are mapped to pixels of a clearly imaging system, or to geospatial coordinates known precisely to the MASINT sensor-carrying platform. In MASINT, the active signal source can be anywhere in the electromagnetic spectrum, from radio waves to X-rays, limited only by the propagation of the signal from the source. X-ray sources, for example, must be in very close proximity to the target, while lasers can illuminate a target from a high satellite orbit. While this discussion has emphasized the electromagnetic spectrum, there are also both active (e.g., sonar) and passive (e.g., hydrophone and microbarograph) acoustic sensors. Several factors make up the quality of a given sensor's information acquisition, but assessing quality can become quite complex when the end product combines the data from multiple sensors. Several factors, however, are commonly used to characterize the basic quality of a single sensing system. Spatial resolution defines the correspondence between each recorded pixel and the square real-world area that the pixel covers. Spectral resolution is the number of discrete frequency (or equivalent) bands recorded in an individual pixel. Remember that relatively coarse spectral resolution from one sensor, such as the spectroscopic analyzer that reveals a "bush" is painted plaster, may greatly enhance the ultimate value of a different sensor with finer spectral resolution. Radiometric resolution is the number of levels of energy recorded, per pixel, in each spectral band. Temporal resolution describes the intervals at which the target is sensed. This is meaningful only in synthetic imaging, comparison over a longer time base, or in producing full-motion imagery. Geospatial resolution is the quality of mapping pixels, especially in multiple passes, to known geographic or other stable references. Cross-cueing is the passing of detection, geolocation and targeting information to another sensor without human intervention.. In a system of sensors, each sensor must understand which other sensors complement it. Typically, some sensors are sensitive (i.e., with a low incidence of false negatives) while others have a low incidence of false positives. A fast sensitive sensor that covers a large area, such as SIGINT or acoustic, can pass coordinates of a target of interest to a sensitive narrowband RF spectrum analyzer for ELINT or a hyperspectral electro-optical sensor. Putting sensitive and selective, or otherwise complementary sensors, into the same reconnaissance or surveillance system enhances the capabilities of the entire system, as in the Rocket Launch Spotter. When combining sensors, however, even a quite coarse sensor of one type can cause a huge increase in the value of another, more fine-grained sensor. For example, a highly precise visible-light camera can create an accurate representation of a tree and its foliage. A coarse spectral analyzer in the visible light spectrum, however, can reveal that the green leaves are painted plastic, and the "tree" is camouflaging something else. Once the fact of camouflage is determined, a next step might be to use imaging radar or some other sensing system that will not be confused by the paint. Cueing, however, is a step before automatic target recognition, which requires both extensive signature libraries and reliable matching to it. ↑ US Army (May 2004). Chapter 9: Measurement and Signals Intelligence. Field Manual 2-0, Intelligence. Department of the Army. ↑ MASINT is exceptionally valuable in detecting deception. A figure hosted by Military Intelligence Professional Bulletin (MIPB). ↑ William K. Moore (Jan-March, 2003). MASINT: new eyes in the battlespace. Retrieved on 2007-10-03. ↑ 5.0 5.1 Ives, John W. (09 April 2002). Army Vision 2010: Integrating Measurement and Signature Intelligence. US Army War College. Retrieved on 2007-10-03. ↑ Lum, Zachary (August 1998). "The measure of MASINT". Journal of Electronic Defense. Retrieved on 2007-10-04. ↑ 7.0 7.1 Center for MASINT Studies and Research. Toward a Better Definition [of MASINT]. Air Force Institute of Technology. ↑ Center for MASINT Studies and Research. Have you been Masinted?. Air Force Institute of Technology. Retrieved on 2007-10-03. ↑ Meiners, Kevin (22 March 2005). Net-Centric ISR. National Defense Industrial Association (NDIA). Retrieved on 2007-10-04. ↑ Bialos, Jeffrey P.; Stuart L. Koehl. The NATO Response Force: Facilitating Coalition Warfare Through Technology Transfer and Sharing. Center for Transatlantic Relations and Funded by the Center for Technology and National Security Policy. Retrieved on 2007-10-04. ↑ Lewis, James A. (January 2004). China as a Military Space Competitor. Retrieved on 2007-11-16. ↑ Interagency OPSEC Support Staff (May 1996). Operations Security Intelligence Threat Handbook, Section 3, Adversary Foreign Intelligence Operations. ↑ Mark Hewish (June 2001). Reformatting Fighter Tactics. Retrieved on 2007-10-17. ↑ National Academy of Sciences Commission on Geosciences, Environment and Resources (April 29-May 2, 1991). Symposium on Naval Warfare and Coastal Oceanography. Retrieved on 2007-10-17. ↑ Bergman, Steven M. (December 1996). The Utility of Hyperspectral Data in Detecting and Discriminating Actual and Decoy Target Vehicles. US Naval Postgraduate School. This page was last modified 23:39, 7 December 2013.